NYC offers endless excitement, yet this city still feels more crowded than an elevator at 5:01 on Friday. But its beauty doesn’t have to be maddening. Whether it’s a 24-hour visit and you got a list of landmarks to check off or you’re a nascent full-time New Yorker (like me, who just celebrated a one-year anniversary with the Big Apple), here’s how to upgrade your experience at the tourist magnets with your sanity still intact. If you can stand a 5am wake up, a sunrise ticket lets you see the urban jungle minus the forest of selfie sticks. 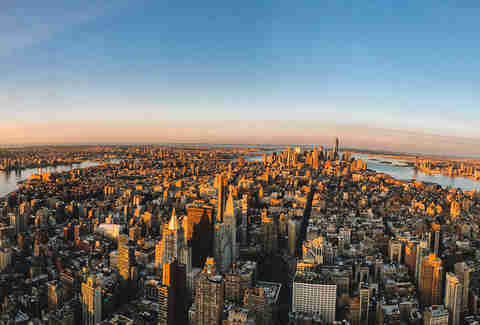 Limited to 100 visitors a day, it guarantees you 360 degrees of unobstructed views from 86 floors up. Even after you’ve seen the city rouse itself, the building’s lobby of 24-karat gold and art-deco murals will still be relatively empty enough for you to stop and soak it all in. Award-winning pastry chef Christina Tosi of Milk Bar and her infamous Crack Pie (aka, toasted oat crust filled with creamy butter filling) attract long lines, but you can bypass them forever by signing up for one of Milk Bar’s baking classes in Williamsburg. From making bite-sized cake truffles to -- duh -- your own Crack Pie from scratch, you’ll learn from the masters and take it all back home to gorge. Or finish it off before crossing the street to The Knitting Factory for premium live music and comedy. Yeah, do it that way. It’s easy to get overwhelmed by performers and six-story billboards in Times Square, so here’s how to avoid pushy Avengers and clueless crowds. Pre-empt any overpriced chain restaurants with $6 plates of roast pork and oxtail at El Sabroso, hidden inside a loading dock on 37th Street. Head west, then north up 8th Avenue (the east side of the street will spare you most Port Authority foot traffic). 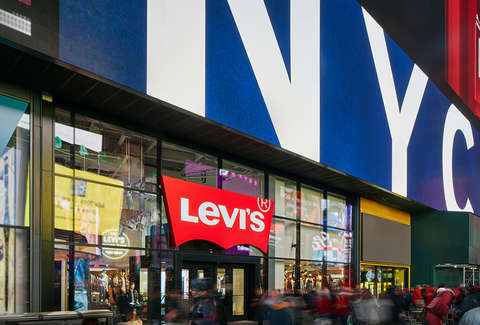 Stay out of pedestrian plazas and savor the view from Levi’s® multi-level flagship store on Broadway. While you’re there, peruse the world’s largest (16,902 feet!) collection of Levi’s® for the perfect T-shirt, jacket, or pair of jeans. Then customize it even further with the store's onsite tailors and direct-to-garment printing of the design you want. 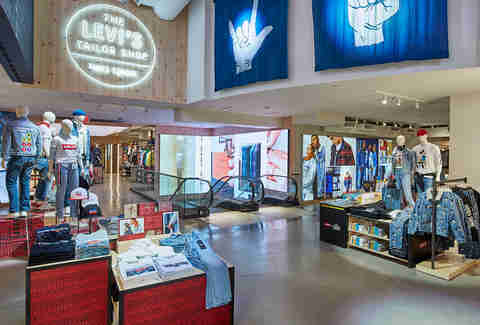 More than just a store, the Levi's® flagship will offer in-house exclusives as well as the largest product assortment under one roof, like Levi’s® Made & Crafted, Levi’s® Vintage Clothing, Kids, and the latest collaborations. Speaking of collaborations, the store's debuting with clothes incorporating visual designs from local NYC creators: graffiti artist Futura, urban photographer 13th Witness, graphic designer Happy Noise, and visual artist Cey Adams. And if you're looking for a little NYC celebrity sighting, Extra! TV will be using the store as its home studio for an entire year. Whew! After all that, you're going to want to relax. So slide down the street to nearby Jimmy’s Corner, Times Square’s most legitimate bar. Is it crowded? Yes. But not with tourists. Besides, now that you’re wearing skinny jeans, you’ll be able to crawl into tighter spaces. Browsing boutiques in SoHo and NoLita is a shopper’s paradise -- until you get buried in the inevitable masses on Broadway. So take a break from celebrity sighting and Prince Street Pizza by heading to the basilica of St. Patrick’s Old Cathedral. Of course, appreciate the 200-year-old church's stained glass windows, but you’re really here to witness the crypts of prominent New Yorkers in Manhattan’s only catacombs. Once you’re done getting spooked on the tour, re-enter the mortal world with a quick walk south to a 20,000-square-foot artistic oasis that is Elizabeth Street Garden, NoLita’s best-kept secret. With the picnic haven of Sheep’s Meadow, Bethesda Fountain, and Loeb Boathouse all near the heavily-trafficked Columbus Circle entrance, most people never see the serene northern part of Central Park. But they're missing out on its most idyllic corner. 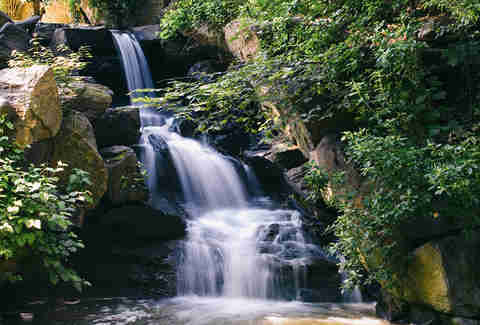 Grab a proper bagel and coffee, and make the worthwhile trek up to The Loch walking path right under the 103rd Street stop on Central Park West to witness the majestic waterfalls modeled after the Adirondacks, Colonial relics, and a boathouse jutting into a willowy lake. The Bronx Zoo is amazing, but visitors crowd the gorillas and snow leopards on weekends and Wednesdays (the day that admission is free). Your best bet to avoid people those days is to be outside when the gates open at 10am and finish up by noon. Whatever cash you saved on entry fees you’ll soon spend at “The REAL Little Italy” on Arthur Avenue, a 10-minute walk away. Whether you want to lunch on a chicken parm hero next to NY firefighters at Joe’s Deli or peruse Vincent’s Meat Market to cook one up yourself, just remember most of the shops close before 6pm and the fresh stuff sells out fast, so an early morning adventure is perfect for these stops. Also, don’t skip on the city’s best bread. Did you know you could test out your tennis swing in Grand Central Terminal via The Vanderbilt Athletic Club? Or that within the same building, there’s a 60-year-old watch shop off the main walkway? 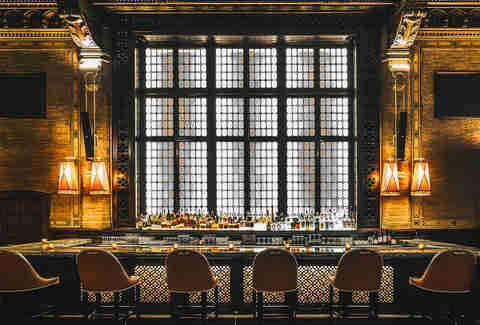 What about sipping Manhattans in The Campbell, a dark, wooden bar tucked away in the southwest corner in what used to be a Jazz Age financier’s private office? Going off the beaten path in Grand Central Terminal is the only way to witness one of the most historic buildings in the city. NYC boasts some of the best comedy in the world, but The Comedy Cellar can only fit so many legends onstage in a night, so don’t waste your time in long lines for the off chance of catching an A-lister trying out new material. Instead, for $10 you can enjoy sketches or solo performances from the next Amy Poehler at Upright Citizens Brigade. Or you know, also from the real Amy Poehler since she co-founded it in ’99. 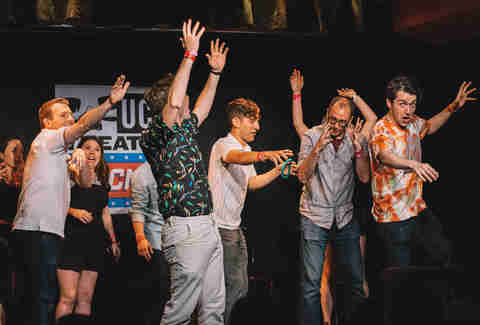 A mix of up-and-comers and vets, UCB will probably seat you next to a famous comedian or soon-to-be-famous writer you’ll only recognize later. Whether you hit up the Hell’s Kitchen or East Village locations, buy a ticket online, and then the only line you need to beat is for where you’ll sit, not if. 30 Rockefeller Center is the center of a two-mile long pathway of shops, restaurants, art-deco architecture, and completely oblivious tourists. The fastest subway exit is via the concourse, and stay on the south hallway to avoid the badly herded crowds queued for the Top of the Rock. If you’re one of them, plan your 70th floor skyline views for the week after New Year’s when the tourists have gone home but that magical 90-foot spruce tree is still up. Twofer! If you just want to see the Statue of Liberty without the tour, take the Liberty Landing ferry from Brookfield Place in Battery Park. 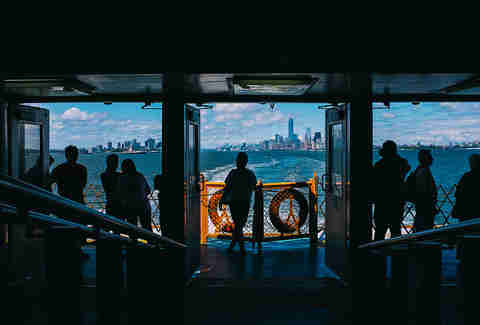 Your $14 roundtrip ticket guarantees you sweeping views of all the downtown landmarks you had on your list, like One World Trade Center, Battery Park, the underrated beauty of the Battery Maritime Building’s Beaux-Arts architecture, and its utter opposite, the Oculus, which finally opened in 2016 and is gorgeous enough to justify the wait. Once you’re across the Hudson, grab a scenic bite at The Liberty House ,which offers spectacular views. But there’s much more ‘Murica to see, since a five-minute cab ride takes you to Liberty State Park’s spacious vista of The Statue of Liberty and Ellis Island. One of America’s most luxurious hotels hosts kings, presidents, Alfred Hitchcock… and you? Inside its marble-walled concourse level lies a semi-hidden food hall that’s a go-to luxe spot for lunching locals. From famous crepe cakes at Lady M Confections, to some of the city’s top pho at Chi Dumplings & Noodles Pho, to foie gras and fromages served with vino from the Rhone Valley at VSV Wine bar, there are 20 opulent food vendors that don’t require Gatsby millions.